I decided to do a cool technique I read about somewhere and since I can’t remember where it came from, I decided to show you the technique here. Here is the finished product, a matchbox cover. 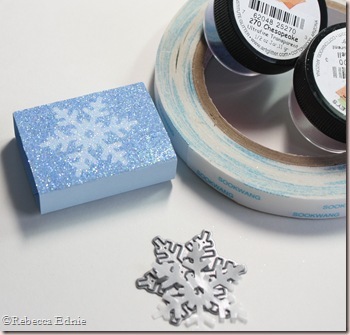 The awesome snowflake pattern is all glitter. You need some wide, flat adhesive; I’ve used Scor-Tape. Then you need to die cut or punch your image from adhesive backing. If you don’t have any on hand, maybe you have some stickers you don’t like or some of those free address labels you can put on envelopes ahead of time. You also need two colours of glitter. Here you can see how I’ve applied the Scor-Tape. Instead of ripping the edges, cut them so they are smooth and finished. You can also see the adhesive backing has been die cut. Ooops, how did my favourite flavour of Hershey’s Kisses get in there… LOL! Here I’ve placed the adhesive backing die cut in place. Be careful to place it with the waxy, shiny side down. I started to do it wrong and while it came off, it might not if I’d left it longer. Here I’ve added the first colour of glitter. 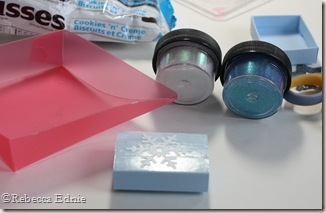 TIP: Press down on the glitter to help it stick to the adhesive. 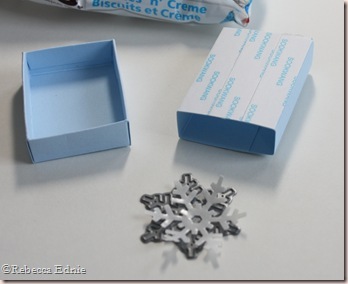 You can see there is no glitter yet on the snowflake. 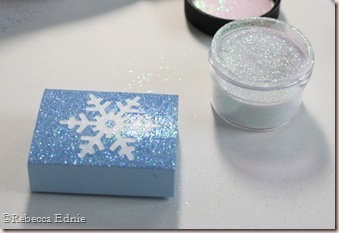 The last step is to remove the snowflake and repeat with the last colour of glitter. Don’t forget to press it down too. This can be done with strips of various widths of adhesive. You could do multiple shapes and colours too. It’s a great technique for one layer cards!